These days people are always trying to make it clear that comics aren't just kids-stuff anymore. And I certainly understand that desire and think that it's incredibly important that more and more people realize that comics are just a medium, and that like television or movies that there are the kind of stories out there that everyone can find and love. There are comics out there for everyone, for people of all tastes and preferences. But lately (and by lately I mean intermittently over the last 20 years) there has been a great deal of comics that have hit the shelves that have been great for younger audiences. More and more, creators are starting to realize that in order for comics to be around for our kids kids that we have to get kids to read comics! And even though I am almost 30 that doesn't mean that I don't still love the heck out of some simple adventure books that appeal to all audiences. I mean honestly, aren't we all still kids at heart? Well, sure some of our inner children are a little more jaded and world weary than others but some of us are still just happy, curious, interested little kids at heart. A goodly majority of the books for all audiences are best described as "Adventure Books". The kind of adventures that we all remember so fondly from the movies and cartoons of our childhood. The kinds of stories where there is a treasure at the end of the road or where a quest must be undertaken to save a parent or friend. Think "Neverending Story". The mother of all adventure comics for all audiences is probably Hergé's The Adventures of Tintin and with a movie coming from Steven Spielberg & Peter Jackson later this year it's probably a good time to familiarize yourself with the great works that are available from Hachette Book Group USA. A great successor to Tintin is Bone by Jeff Smith. Bone is a wonderful story of fantasy and adventure that matures with the reader and is the kind of book that kids will want to read again and again. 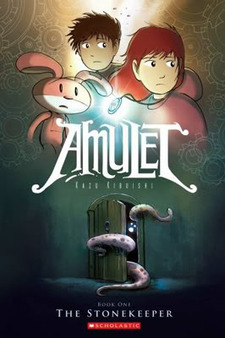 In the spirit of Bone is Amulet by Kazu Kibiushi (who also edits the anthology series Flight that is a great recommendation for all ages). Kibiushi crafts a brilliant world that at once hearkens Smith's work as well as the animation work of Hayao Miyazaki (the brilliant mind behind Howl's Moving Castle, Ponyo, Spirited Away, My Neighbor Totoro, and more). In a more American vein (if not a little British) is James Robinson's Leave it to Chance. The series is far more brief than most fans would prefer (only 3 brief volumes collect the entire series) but it is certainly worth seeking out. There are so many good comics coming out these days that are aimed at getting all audiences involved that I can't even contain them all in one post. So come back next week for more.